Recently I had an interesting conversation with a friend of mine. She was narrating a situation in which she and her colleague had some disagreement about something. My friend had suggested going to a temple. Her friend wasn’t interested in going to temple and had rejected the idea. Moreover, being an atheist, she made few strong statements on the non-existence of God. My friend who is quite a pious person strongly felt about this. Though she didn’t voice her disagreement openly ,thinking it might affect their working relation, she found me as an outlet for venting her anger on her colleague. “How could she say that God doesn’t exist and that one shouldn’t go to temples”. While, I understood her feeling about being reverent, she was unable to take the feeling that her colleague had mocked at her beliefs. I felt bad for her more for the fact that she was allowing her time to be wasted by thinking about something which had already happened. More-ever, her friend can't be blamed too, since she believes in the non-existence of God and hence she would justify her own thoughts. My friend wasn’t really convinced with this. We tend to come across this kind of situation many times. Sometimes, our colleagues, friends behave in a way which is completely unacceptable to us. Irrespective of their behavior being right or wrong, the message which I want to share with others is the concept of considering the perspective of others. At least for the sake for not upsetting yourselves and end up wasting your time by thinking about others. Though, we may think that our view is justified, there is a chance that the other person may be right in someway. In order to substantiate my point, let me take you through a small exercise. Look at the picture shown below very closely and try to see anything you can. Make a note of, what you see in that. This research was done in Harvard Business school. Half of the students were shown the image of the young girl and remaining the old woman image. Then they were called to the classroom and shown the picture. Almost all the students who were shown the image of the young woman saw the young woman in the picture. And the students who had seen the old lady image saw the image of the old lady. 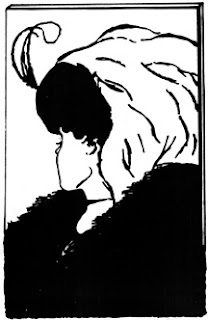 When the class was asked to explain what they had seen, the class started arguing about the image identity, half the class saying that there was a young girl in the picture and the other half claiming it was a old woman. Finally, only when a student went up to the board and pointed to the drawing saying that it is the woman’s necklace, did another student pointed that it was the old woman’s mouth. Then only the student started calmly discussing the specific points of difference and both groups came to see each others opinion. This was shown to demonstrate clearly and eloquently that two people can see the same thing and yet disagree, and yet both may be right. The next step of not agreeing with another's perspective is assuming all sorts of things that were never intended. This step is even more dangerous! A nice take on perspectives and something most of us need too. I agree what you have said and I am one of those persons who take a lot of things to heart and argue and vent to no end about things that had obviously happened and might be right at the other persons end. A post much needed for me at the right time. Thanks. @DI: Very true, Rajesh. Sometimes our imagination creates lots of thing which in reality may not be true. we need to learn to respect opinion of others even if they are wrong.